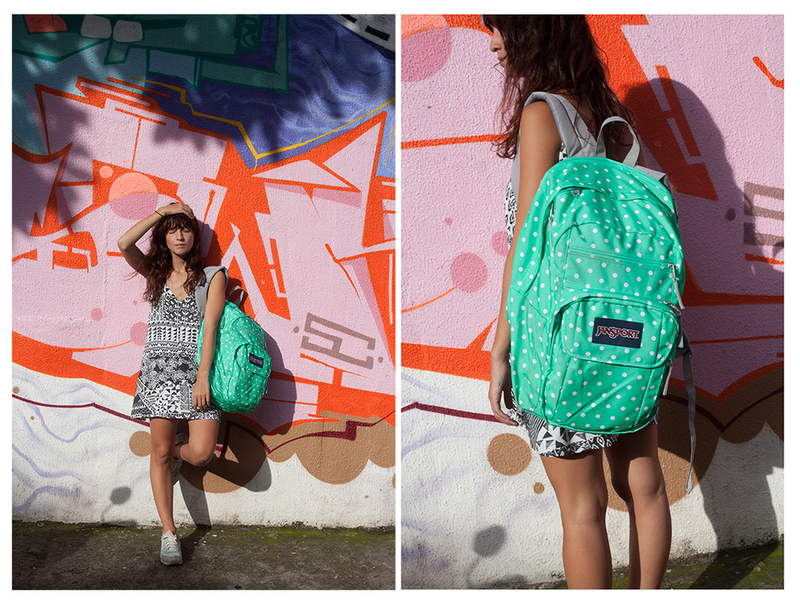 That's the concept behind JanSport's Live Outside Campaign, which just went live. This was my second year photographing the campaign, and it's easily one of the best projects to work on. What I love so much about this campaign is how 100% real it is. JanSport is all about having fun outside with your friends, and they find the best ways to bring that to life by really creating fun situations with real people. We're not talking about staged shoots with artists in dirty clothes pretending to paint a wall. Live Outside is all about documenting the process of real artists creating something beautiful and having a lot of fun with their friends along the way. See more of the photos on my website here. And check out the really fun episodes that the video team shot during our adventures all over Rio here. Photos from the shoot will be on the JanSport website, social media, print materials, all over really. It's true. I fell in love with 100 Brazilian women. One of them was 93 years old. One is proudly polyamorous and staunchly defends each women’s right to love and make love however and with whomever she wants. One very directly told me that she’s fat, not curvy or big, just fat. She hasn’t always felt comfortable with it, but at this point in her life, she just loves being in her body and no longer wastes energy worrying about how others feel about how she looks. One taught me that the way that the world sexualizes and fetishizes Brazilian women is just an illusion, and that illusion can make life very difficult for Brazilian women trying to understand their own identity. One blew me away with her courage. Very well-known living as a man in socially-conservative Brazil, she had the strength to transition to living as a woman with the whole country watching and has become a leader for so many in the LGBTQI community. One taught me about samba and how it’s not just the drums that I hear every Sunday evening from the Samba club a couple blocks away, but it’s her roots, an energy that she carries on her skin and that transports her back to where she is from in Africa, a place that she has never met in person but knows very well in her soul. One took me along with her sometimes when she was working in the slums, and she showed me that valuing someone’s existence enough to just be present is an enormous and life-changing gift. These women were not romantic loves. They were far more significant than most of my romantic relationships have been. These were women who bared their skin, and their souls, to be photographed by me, a stranger. I wanted to photograph 100 Brazilian women. Just their skin, in natural light. Nothing fake or staged or artificial, not like the way that we’ve become accustomed to seeing women represented. Just bodies and light. I began the journey thinking that I wanted to learn about Brazil, but now I see that I wanted to learn about femininity, about bodies, about intimacy, about myself. In a particularly difficult moment in my life, when I was living as a foreigner, heartbroken in a relationship that couldn’t work and doubtful of myself and the decisions that I make in my own life, each of these women met me on my journey and helped to show that there is beauty in the way I see the world, and that this beauty mattered to other people as well. Thank you lovely Brazilian women for showing me that to be in love is much more than just being in a romantic relationship. It is revealing yourself to another person, and witnessing without judgement. It is a state of being open and being connected, allowing yourself to be vulnerable and be truly seen.